Perfect for figuring out what you really want to do with your time when you finally have some extra time. 54 cards, each with an activity and definition. Comes complete with one worksheet (you can order more). The worksheet will explain how to use the card sort. 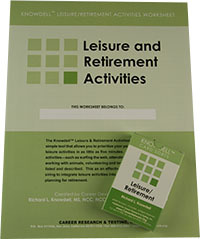 This is the perfect way to discover or remember what truly interests you, so that you can make the most of your leisure time and retirement time. Also a great way to discover new interests and new hobbies.